With the recent GDP print of 4.1%, many optimists have a recharged outlook on the trajectory of the economy. 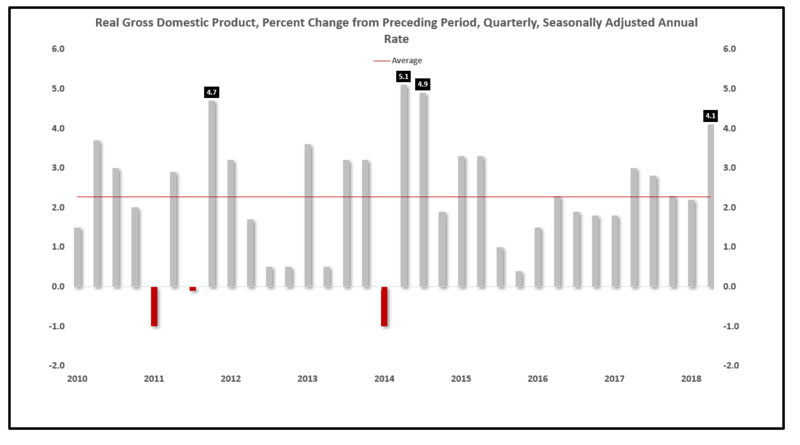 Real GDP increased 4.1% in the second quarter of 2018 on a seasonally adjusted annualized basis. What that means is if GDP continues to increase for four quarters in a row at the current rate, the 12-month GDP growth would be 4.1%. The chart below shows the volatility of this measure, both up and down. The average growth rate since the start of this economic cycle is 2.3% with three quarters in the past printing above the current 4.1% rate. A better measure, something I repeat endlessly to subscribers of EPB Macro Research, is the year-over-year growth rate. In other words, how much did GDP grow from Q2 this year compared to Q2 last year? What is the 12-month change? On a year-over-year basis, which is the form that all data points will be in moving forward, it increased by 2.85%. 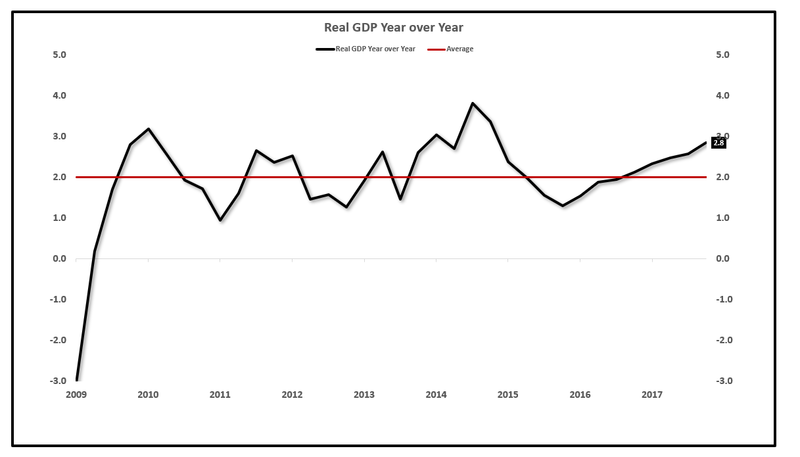 The year-over-year change in real GDP sets the stage for how strong the consumer is and how much growth can truly be generated. Looking at the growth rate in context shows the current rate is slightly above the 10-year average and lower than the cycle high made in 2015. Will the consumer be able to push GDP growth above 2.8%? Below we will look at consumption and income trends for the US consumer. The US consumer makes up about 70% of GDP and is the driving force behind the long-term potential growth rate. “Personal Income” reported by the Bureau of Economic Analysis (BEA) is the most comprehensive data point on total personal income. Average hourly earnings, the data point for income growth that is most commonly reported is perhaps the worst and most misleading data point in all of economics. For more on why I do not use average hourly earnings, click here. Personal income represents all income to individuals including wages/salaries, small business income, rental income, dividend and investment income, government transfer payments and more. To get the most comprehensive look on aggregate income, we must use the broadest category of personal income. Adjusting for inflation, total personal income is currently increasing at a pace of 2.6%. How much faster than 2.9% can the economy grow if total personal income growth is 2.6%? The easy answer is not much. Without a sustained rise in total personal income above 3%, the probability of GDP staying above trend remains low. In the BEA tables, there is a breakdown for each category that comprises total personal income. Wages and salaries make up roughly 50% of total personal income. A growing share, now 17% of total personal income, is government transfer payments such as Social Security, Medicare, and Medicaid. For more on how this category has grown over time, click here. Flipping back to wages, 50% of total personal income growth has been flat to down over the past year. As of the last reporting period, wages and salaries are up 2.98% compared to one year ago after adjusting for inflation. 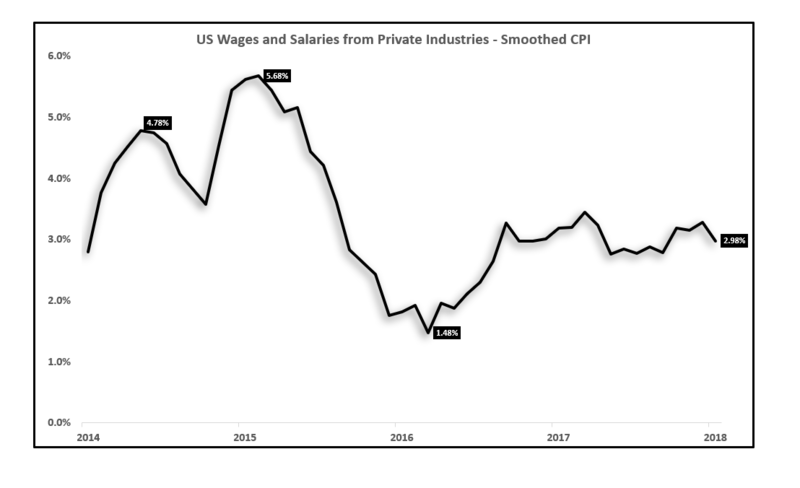 Wage growth has been flat and has been down significantly since 2015. It is not a surprise that in 2015, the economy was able to grow above 3% with wages and salaries growth at nearly 6%, but the question remains if the economy is booming, where is the wage growth? Sub 3% real income growth will result in sub 3% long run economic growth. After establishing that real GDP growth is sub 3% and real income growth is sub 3% and falling, we can now move to a more focused portion of the economy. Consumption represents 70% of total GDP and is the most important driver of economic activity in the United States. A basic rule of economics is that over the long run, you can only consume what you earn. Consuming more than what you earn in the present simply comes at the expense of future consumption. Consuming more than you earn must come in the form of debt, which must be paid back at a later date. Income growth and consumption growth are therefore closely linked. After adjusting for inflation, consumption growth is up 2.8% year over year. Consumption growth has moved lower over the past three years and similar to income growth, is well off the high made in late 2014 and early 2015. This is the one chart that shows the health of the consumer: income growth vs. consumption growth. The chart below shows both the growth rate in total personal income and the growth rate in total consumption, both adjusted for inflation. 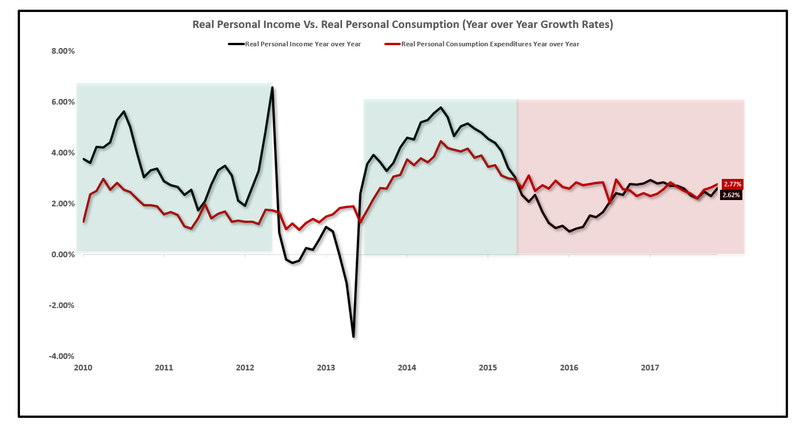 Personal income growth is in black and consumption growth is in red. 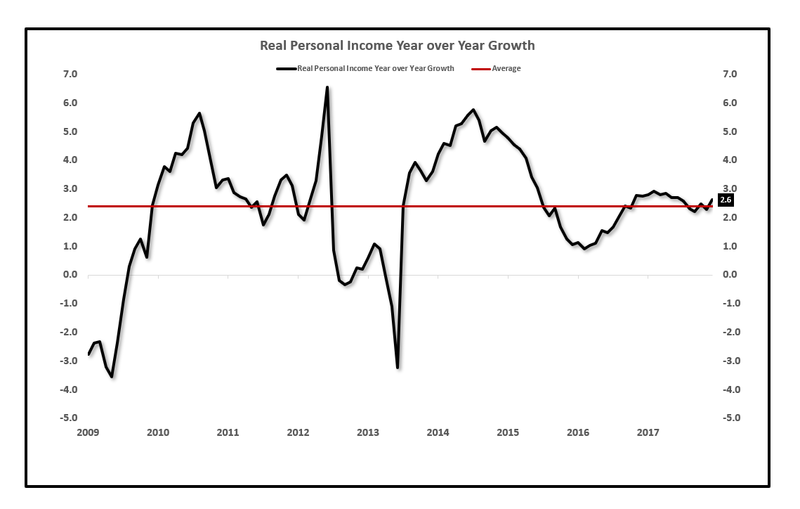 When the black line is above the red line, income growth is outpacing consumption growth, a healthy and sustainable trend. When income growth was accelerating to the high in 2014-2015, income growth was outpacing a very healthy rate of consumption growth of 4%. The last several years, highlighted by the red box, shows that on balance, consumption growth has been outpacing income growth, an unhealthy and unsustainable trend. The difference in the growth rate of income and consumption must be bridged with debt, which will ultimately weigh on long-run growth. The last two years were reported widely as a very strong period of economic growth yet income growth fell below consumption growth. Going back to the original question, how can GDP growth be expected to continue accelerating higher if there is no income growth to support it? If Depressed Income Growth Persists, What Is The Effect? It is empirically clear that income growth did not accelerate to new highs as the stock market did coming off the 2016 lows. In fact, income growth and consumption growth are far below the peak in the economic cycle back in 2015. If income growth remains low causing consumption growth to remain low, sub 3% and likely falling back towards the trend of 2%, what will the effect be on the stock market and the bond market? It is much more difficult to extrapolate various economic trends into the stock market compared to the bond market. The bond market is much more nuanced to changes in the direction of the economic data than the stock market. With that said, there are several sectors of the stock market that by definition are very closely linked to the health of the consumer. Retail stocks are a great example of a cyclical sector that needs a strong consumer to continue to thrive. Depressed income growth with a steadily increasing cost of living is a recipe for households to pull back consumption in various discretionary areas. The SPDR Retail ETF (XRT) gives a very good approximation for the aggregate health of retail stocks. Amazon (AMZN) is a part of the XRT ETF, but at less than a 2% weighting, so the results of the index are not likely to be skewed by any one stock. 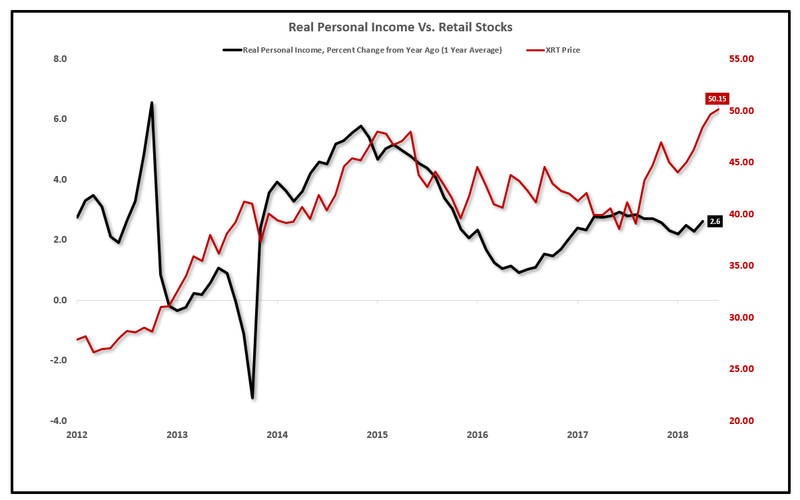 Retail stocks in the past several months have gotten caught up in the euphoria of the market, detaching themselves from the underlying fundamentals of lagging income growth. The fundamentals of the consumer suggest that the retail stocks, as a broad category, have gotten ahead of themselves in recent months. Many longer-term followers and subscribers of EPB Macro Research have a good idea surrounding what slower growth means for long-term interest rates. To put it simply, long-term interest rates will follow the trend in nominal GDP growth. If growth remains depressed, interest rates will remain depressed. With lackluster income growth, it is going to be hard for growth to meaningfully accelerate from here, which is why interest rates are unlikely to rise on the long-end of the Treasury curve. The Federal Reserve may continue to raise short-term interest rates but unless growth picks up, long-term interest rates will stay put. Each mild rise in interest rates comes with deafening calls for the end to the secular bond bull market without analysis as to why interest rates are so low, to begin with. Rates are low because growth is low. Rates are not low due to Quantitative easing (QE). Can you spot the effect of QE on the chart below? The below chart takes the 10-year average GDP growth rate compared to the 10-year treasury rate as opposed to the chart above, which uses the year over year growth rate in GDP. The chart below is used to show how the long-term bond market does not buy into cycle spurts in growth but rather tracks the long-term underlying growth rate of the economy. A common misconception is that Quantitative Easing (QE) suppressed long-term interest rates and continues to do so years after the Fed officially stopped new bond purchases. 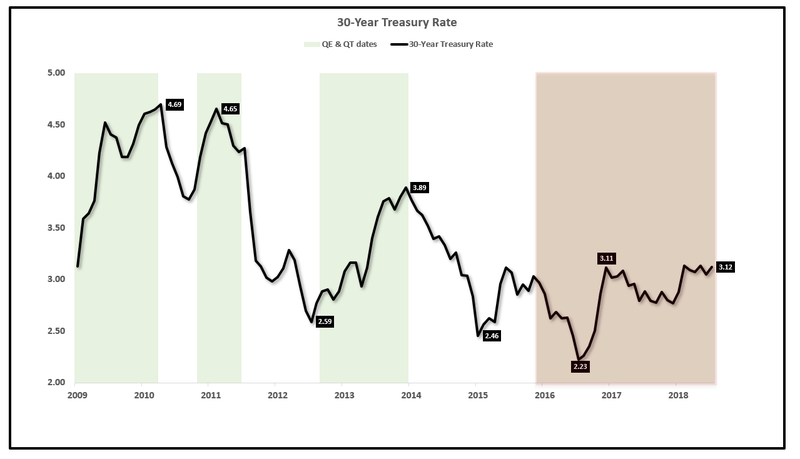 The chart below shows the 30-year treasury rate with each QE time period highlighted in green. The chart clearly shows that interest rates rose during each round of QE and fell when there was no bond buying. QE raised inflation expectations, which lowered bond prices temporarily, although inflation never materialized. Also, learning from economist Milton Friedman, monetary accelerations (QE) lead to higher long-term interest rates and lower short-term interest rates. The inverse of Friedman’s theory is also true, that monetary decelerations (tightening) lead to higher short-term rates and lower long-term interest rates over time. If monetary decelerations (QT, interest rate hikes etc.) persist long enough, eventually it has a negative impact on income, employment and GDP growth. This lowering of economic growth serves to lower long-term interest rates as the data above shows. We are already seeing muted wage growth and weak consumption growth. The weak underlying growth will continue to put downward pressure on interest rates. In December 2015, at the time of the first interest rate increase, the 30-year yield was 3.02%. After 7 interest rate hikes, a tax-cut, increased bond supply from the Treasury and now balance sheet reduction from the Fed, 30-year yields are flat, sitting at 3.08%. More interest rate increases and economic stimulus may have a very minor effect on long-term yields, but the impact will prove temporary, as we have seen over the past three years. Without an accompanying rise in underlying growth, interest rates will stay depressed. The economy needs higher levels of income growth in order to see “escape velocity” and sustained growth rates above 3%. 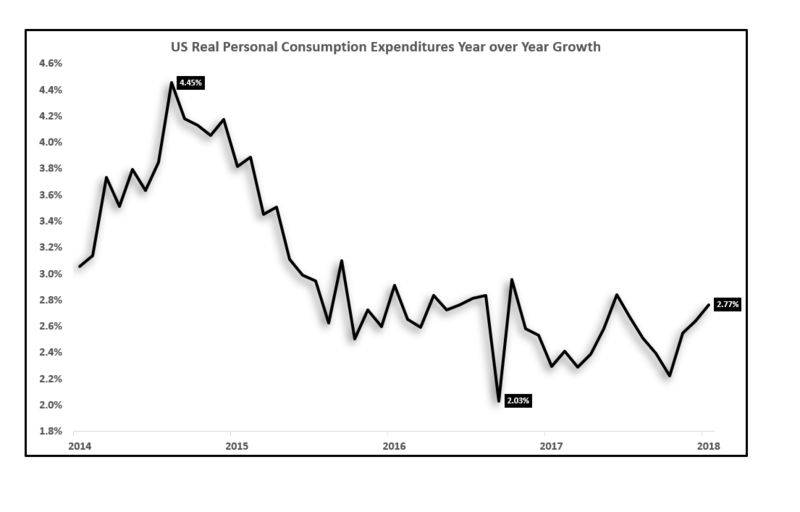 The consumer does not appear to be in the position to deliver the necessary consumption growth for higher rates of economic growth without taking on more debt. Note From The Author: Members of EPB Macro Research receive articles and actionable investing themes like this often. On top of more frequent updates, members receive dozens of additional benefits including two model portfolios with exact asset allocation percentages to capitalize on being ahead of key inflection points in the economy. If you would like to learn about all the benefits of EPB Macro Research, as well as try out the service for a free two weeks, click the link below. Disclosure: I am/we are long TLT.